Permanent cosmetic make-up is a procedure that permanently implants pigments into the skin to add color. It defines, or enhances eyebrows, eyelash lines, lip shapes and colors. Other names for the same procedure are "intradermal pigmentation" and "micropigmentation." Each term means "tattooing." While traditional tattooing art work is done on the body to be seen, admired or to make a statement, cosmetic tattooing when done well, should not be recognized or identified as tattooing. 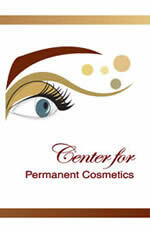 Clients of The Center for Permanent Cosmetics are assured that they will receive the finest, most advanced and safest forms of permanent cosmetic application. Procedures are done in the most sanitary conditions consistent with OSHA regulations. Disposable gowns, gloves, masks, and eye protection are used to insure that safety and sanitation exceed the standards in the industry. Click here to review our Frequently Asked Questions. Simply schedule an appointment for a consultation to discuss how you can look your best all the time with permanent cosmetics. Your complimentary consultation will includes a discussion regarding the procedure, information concerning the artistry of your interest, pre and post care, as well as safely aspects of products and equipment.